Monday after work I went down to Lower Manhattan and I took the Staten Island Ferry to see the Staten Island Yankees play the Aberdeen Ironbirds at Richmond County Ballpark at St. George. Before I got to the ballpark, I stopped off at Subway in the Ferry Terminal to have a pre game meal. When I got there I was greeted by my pal Eddie Pelle who was waiting for his buddy Fredy Sanchez to come off the boat. He did with his girlfriend Kate who he introduced to me while I was finishing up my dinner. Once I was done, we all walked over to the ballpark. It was their first time there they said. It was nice to spend the special occasion with them. They're good people. As for the game we saw, the Yankees wound up winning, 3-2 in 13 innings. I missed the last inning because I wanted to make the 11PM boat so I could get home at a reasonable time. I wound up getting home at 12:15AM. Of course the game ended right after the boat pulled out Eddie said. He wound up staying to the end. I hated to leave but I need to get sleep in order to function properly at work. 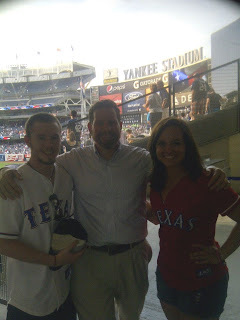 Tuesday night after work I went up to the Bronx to see the Yankees open up a three game series with the Texas Rangers. Before I went into Yankee Stadium, I stopped off at Burger King for dinner. When I got to my seat in section 420B row 7 I was greeted by the King. For whatever reason, we didn't have anybody else around that we knew. As for the game we saw, it was a battle of Japanese pitchers as Yu Darvish of the Rangers started against the Yankees' Hiroki Kuroda. It should be noted this was the first time I saw Yu Darvish pitch live. Since he arrived here in the United States, he's pitched well. On this night, he wasn't anything special in my eyes. He wound up giving up three runs. He didn't get a decision and he threw a lot of pitches. Hiroki Kuroda pitched slightly better but he didn't get a decision either. Ironically the game was decided by fellow countryman Ichiro Suzuki who hit a game winning home run with two out in the bottom of the ninth inning to give the Yankees a 4-3 win. I was relieved when he did. I didn't want to see another extra inning game. Wednesday night after work I returned to the Bronx for game two of the series. This time I went to the Court Deli Restaurant and I picked up a corned beef sandwich for myself. When I went inside the Stadium. I headed towards the Bleachers because I arranged to meet up with some fellow roadtrippers out there. I'm referring to Reachelle Spieker and her friend/travel partner Patrick Smith who were in the midst of seeing all 30 major league ballparks over a three month period from May to August. They call it their Stitched In Our Soul Tour aka SIOS. It was a pleasure to meet and greet them. Reachelle is originally from Dallas, Texas. With that being said, she's a huge Ranger fan. She now lives in Southern California. She came dressed for the occasion. She broke out her cowboy boots to show her Texas pride. As for Patrick, he's going to school at Oklahoma University in Norman, Oklahoma. He's also a big Ranger fan. 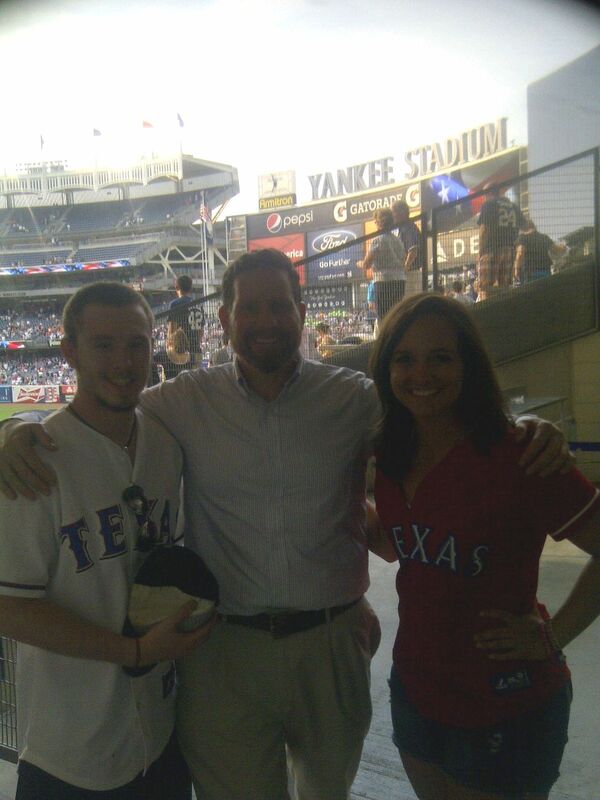 As for the game we saw, it turned out to be a great night for them as the Rangers beat the Yankees, 8-5. Thursday night after work I went back to Staten Island to see the Baby Bombers play again. This time they hosted the Hudson Valley Renegades. Before the game I stopped off at Subway again in the Ferry Terminal and I had a sandwich. When I got to the ballpark I was joined by the King and our pals Frank Anichiarico, Bryan Gilligan, Vincent Ascanio and Michael Abrams. As for the game we saw, the Renegades and the Yankees played a slugfest until mother nature interfered in the 6th inning. With the Renegades up, 10-8 at the time the game was official. Once they put the tarp on the field, we all decided to leave knowing they probably weren't going to resume. This time we made a wise decision. The game was called off. As a result, the Renegades got the rain shortened victory. Friday night after work I dashed out of the office so I could get to Citi Field as soon as possible. The Mets were playing the Washington Nationals in the first of three games over the weekend. I was determined to see my boy Gio Gonzalez after batting practice. Stay tuned for a special post that will go into further detail about that. On my way upstairs I got to see Reachelle Spieker and Patrick Smith again as their SIOS Tour continued. This time they were at Citi Field. They said they were much more impressed with the ballpark than they were with Yankee Stadium. When I finally got to the Royal Court in section 516, I was joined by Phil Butleman, Manny Morales, David Sack, Al Linderman, Frank Anichiarico & Pat Gorman. As for the game we saw, Matt Harvey started and he pitched great for the first seven innings. He struck out eleven Nationals. He left winning the game, 4-0. Manager Terry Collins decided to overmanage with his bullpen and it came back to bite him. They blew the game for the Mets and Matt Harvey who wound up getting a no decision for his stellar performance. The Mets lost, 6-4. After the game, we went to Donovan's Pub to forget about the nightmare ending we saw. Stay tuned for a few special posts about the rest of the weekend and one on Gio Gonzalez. Please bear with me as I try my best to catch up. Royalty sees the Home Run Derby at Citi Field!